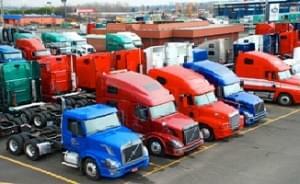 Freight Rate Central works with Pennsylvania trucking companies and carriers from all over the continental US to bring you the lowest available rates for truckload, less-than-truckload and specialized shipping requirements, including over-dimensional and over-weight shipments. We ship goods to, from and through Pennsylvania and throughout the US, and we can arrange for international shipping as well. 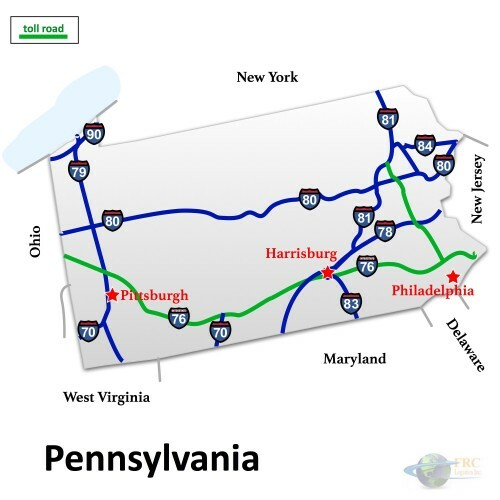 Both businesses and individuals that need to arrange shipping to or from Pennsylvania can depend on FRC Logistics to make the process straightforward and low risk. Freight Rate Central makes shipping easy by working with carriers and state authorities to arrange pick-up and drop-off, pull all the necessary permits, and plan routes to avoid added expense and reduce the risk of delays. Pennsylvania has a fairly extensive network of interstate highways. The I-79 runs north-south from West Virginia, through Pittsburgh, ending in Erie, while the I-81 runs from New York to Maryland, through Scranton, on the eastern side of the state. The I-80 bisects Pennsylvania from east to west, while the I-76, a toll road, runs east-west on the southern side of the state. With its humid continental climate, Pennsylvania has cold winters and hot, wet summers. Tornados are not unheard of, although they are not as common as they are further to the west. 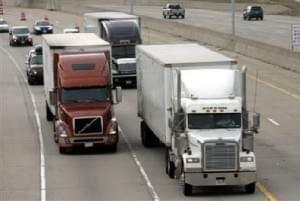 Weather-related delays can be a consideration in Pennsylvania trucking during the winter. In the twentieth century, Pennsylvania was best known for its industrial economy, including steel production and product manufacturing, as well as agriculture. Today, the state has expanded into new economic frontiers such as film and the financial sector. Pennsylvania ships goods all over the country, as well as overseas. Pennsylvania to New York a busy route, as is Pennsylvania to New Jersey. Pennsylvania also ships good to midwestern states like Ohio and Illinois, and to western states, most commonly California and Texas. 70’-0” in length, or 60’-0” on roads and highways without medians, with maximum overhangs of 4’-0” in front and 6’-0” at the rear of the trailer. Anything larger or heavier than an oversized load is considered a supersized load and requires special arrangements, including pilot cars.